This post was commissioned as part of a Pulitzer Center/Global Voices Online series on Food Insecurity . These reports draw on multimedia reporting featured on the Pulitzer Gateway to Food Insecurity  and bloggers discussing the issues worldwide. As governments gear up for the United Nations Climate Change Conference (COP17)  in Durban, South Africa, which starts today, experts are warning that among climate change's greatest consequences in developing countries such as Bangladesh are risks to the agriculture sector, including an increased risk of hunger, malnutrition and food insecurity. Forecasts predict that climate change could reduce agricultural production and increase food prices, raising the risk of hunger and malnutrition. A World Food Programme report says that by 2050, climate change is expected to increase the number of hungry people by 10 to 20 percent , and the number of malnourished children is expected to increase by 24 million – 21 percent more than without the effect of climate change. Most of the increase is expected in Sub-Saharan Africa and parts of South Asia and Central America, as detailed in these maps . Already, the report says, natural disasters are more frequent and intense, land and water are becoming more scarce and difficult to access and it is getting harder to achieve increases in agricultural productivity. At least ten countries  are highly vulnerable to a climate-related food crisis, an ActionAid report released last month showed. Among the five most vulnerable countries, alongside the Democratic Republic of Congo, Burundi, South Africa and Haiti, is Bangladesh. 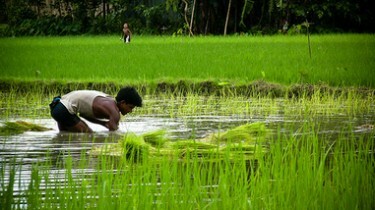 Composed largely of low-lying land and islands with a high density population, little arable land, and frequent natural disasters, Bangladesh has been described as the “'ground zero’ at the intersection of climate change and food security”  by bloggers from the World Bank and Aid Data. Bangladesh has made progress in reducing hunger, with its number of undernourished people dropping to 27 percent  as of January 2011, and its annual rice production  tripling over three decades. But since agriculture is a key economic industry, making up nearly 20 percent of Bangladesh's gross domestic product (GDP)  and 65 percent of the labor force according to a World Bank report, climate change threatens to erode these gains. The World Food Programme report estimates that substantial international action to reduce greenhouse gas emissions could halve the increase of hunger from climate change . To improve awareness of climate change issues among Bangladeshis, as well as voice their stories of climate change, gender and food sovereignty, two groups have organized a climate change caravan  that is currently traveling across the country. One hope is that these stories will help motivate solutions from Western countries, which often use a much larger share of the world's food, water, energy and carbon than developing countries, according to the ActionAid report. For example, each U.S. citizen consumes an average of 260 pounds of meat per year, about 40 times more than the average Bangladeshi.